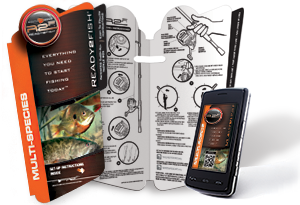 Ready2Fish® is THE ORIGINAL and complete combo fishing system that gives any angler everything they need to start fishing today. 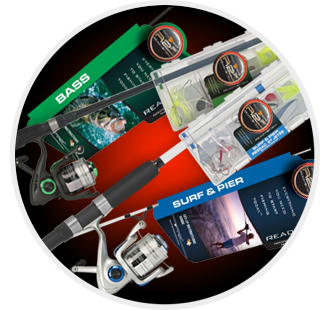 We carefully engineer and thoughtfully design each detail of every rod and reel component, from the vented spool reels and split grip rods, to the high-tech finishes and color-coding system. Every piece of tackle in the new "Easy Transport" Tackle Kit has been hand selected by seasoned professionals, and matched specifically to each combo specie or application. 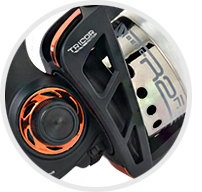 Our new TRICOR rotor has been completely reengineered to provide the best possible balance, as well as greater strength and stability to increase reel life and keep you on the water longer. Comes standard on all Ready2Fish spinning combos. In addition, every combo comes with illustrated, easy-to-read instructions inside the combo flag. These how-to tips, instructions and rigging guides are also accessible and downloadable from this website across any desktop, tablet or mobile device. Check out all the NEW Ready2Fish® Combo Kits below! The NEW Ready2Fish® Telescopic Combos are fully functional, portable fishing kits that feature everything you need to start fishing today. 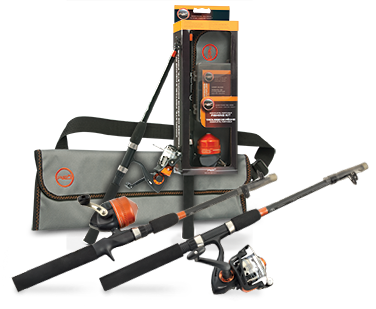 Each portable fishing kit includes a 1-piece, high performance telescoping fiberglass rod with ball bearing drive, pre-spooled reel, complete tackle kit and how-to-fish guide, all neatly storable in a custom R2F® travel bag. 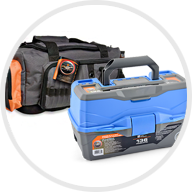 When traveling, where space is limited, or just kept in the trunk "in case", these portable combo kits are convenient, compact and ready to GO! 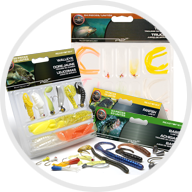 The Ready2Fish® assortment of tackle storage, lure kits and tool kits provide extra enjoyment for any level of angler. Tackle storage systems include a soft-sided, multi-compartment tackle bag and hard-sided 1-, 2- and 3-tray Flambeau® traditional style tackle boxes; a must-have for every angler. Specie specific lure kits are available for the most popular species. 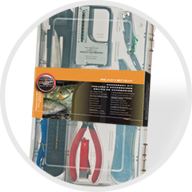 The freshwater tool kit includes all the basic tools needed for freshwater fishing.